Past news from Center Street Studio's editions. Current news can be found on the homepage. 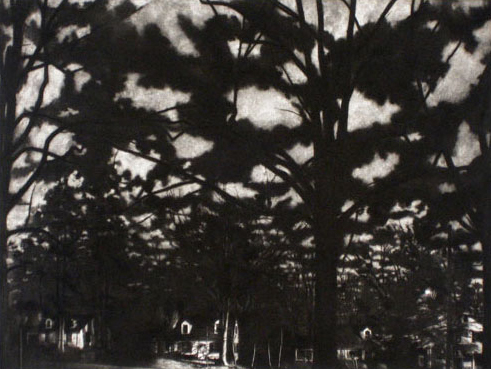 Center Street Studio is pleased to announce the release of a new photogravure by Andy Freeberg. This is a second image from his GUARDIAN series depicting Russian museum guards at their posts. Entitled 'Dying Slave and Moses - Pushkin Museum,' it measures 16 x 24 inches (plate), 22.5 x 31 inches (sheet). The photogravure plate was beautifully crafted by Paul Taylor of Renaissance Press. It was printed in an edition of 45 on HahnemÃ¼hle Copperplate paper. Please contact Director James Stroud for price information. Center Street Studio is pleased to announce the publication of a new photogravure project by San Francisco artist Andy Freeberg. Fresh from his success with his SENTRY photographs of Chelsea gallery reception desks in New York, Andy traveled to Russia where he got permission to photograph inside state museums. What emerged from this trip was a wonderful series of portraits of the museum guards sitting stoically amidst their charges, often revealing interesting, yet unintended, relationships between the sitter and the art. James Stroud invited Andy to choose two images from the GUARDIANS series that would best translate into a black and white gravure plates. The first plate, crafted by artist and platemaker Lothar Osterburg in New York, is entitled 'Antonius Pius, Youth and Caryatid - Hermitage Museum.' It measures 16 x 22 inches and is printed on Hahnemahle Copperplate paper in an edition of 45. Please contact James Stroud, Director for price information. Center Street Studio is pleased to announce our first publication of the Fall season: GYRO, a suite of 3 color aquatints by Bill Thompson. For those of you who have followed Bill's work, you will recognize these images as excellent examples of how he translates issues explored in his wall sculptures into print. The first step was to create 3 unique shapes similar to, but more eccentric than, ones found in his Rounds paintings. Cut out of matt board and refined with sanding, these shapes were then scanned into a computer and relayed to a waterjet cutting machine where they were cut out of copper. The copper plates were similarly refined, covered with aquatint and etched to 100% saturation. They were then inked and wiped with one color and surface rolled with another that, when printed, resulted in an uncommon saturation and mix typically not found in single plate etching. The prints display a chromatic intensity on par with what Bill achieves in his automotive paint surfaces and contribute to the ongoing dialogue he maintains between painting and sculpture. Each print measures 23 x 22.5 inches and is printed in an edition of 25 plus 5 artist proofs. They are available as a suite of 3 prints. Contact Director James Stroud for price information. Richard Ryan's new woodcut for 2009 is 'Bird 1'. Equally impressive in scale as his 'nine black poppies' from 2008, it measures 53 x 40 inches (image) and is printed on a 60 x 43 inch sheet of natural Kozo paper. Please contact James Stroud, Director for further information. Center Street Studio is pleased to announce the publication of Richard Ryan's nine black poppies, a woodcut printed on natural Kozo paper. The print measures 54 x 40 inches (image), 60 x 43 inches (sheet) and took the artist a year to cut into the block. Contact James Stroud, Director for price information and availability. Center Street Studio is also pleased to announce that the Joel and Lila Harnett Museum of Art at the University of Richmond will acquire the Center Street Studio archives. To help raise the needed funds, the museum produced this benefit portfolio in collaboration with Center Street Studio entitled Natural Selections. Originally offered to donors of $10,000. or more, a recent matching gift for the acquisition of the archives allows the museum to offer the remaining portfolios for only $5,000. The portfolios contain prints by artists who have either worked with master printer James Stroud in the past or have had exhibitions at the museum. The list of artists include: Anne Harris, Nell Blaine, Carolyn Harris, Bernard Chaet, Charles Ritchie, Tanja Softic', James Stroud, Bill Thompson, John Walker and George Whitman. Contact Center Street Studio Director James Stroud at jstroud@centerstreetstudio.com or Executive Director of University Museums Richard Waller at rwaller@richmond.edu for a prospectus. 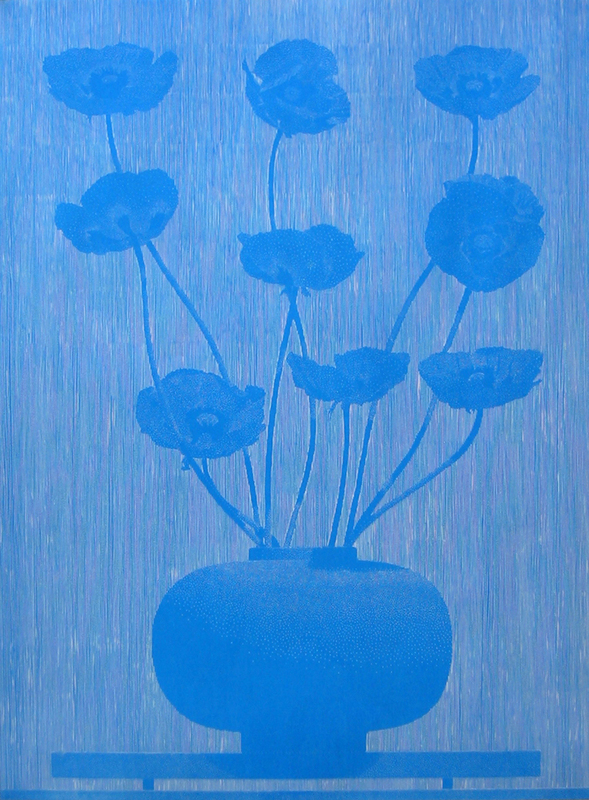 "My 'Nine Blue Poppies' woodcut project began as a gouache study for a large painting. Over the last fourteen years I have been made a number of paintings of things that grow on my property, either in my garden, or wild in the landscape. Last year was a good year for our poppy plants; the flowers were large and particularly malevolent. There were six main thoughts in my mind when I decided to try to use these flowers for a painting: their dark beauty, the color blue, our current wars in the middle east, the anti war poetry of the first world war in Europe, the heroin trade, and one of my favorite songs by Captain Beefheart, 'Veterans Day Poppy.' These thoughts kept combining and recombining in various forms of meanings, ironies, and paradoxes. I decided this would do for a start." As the title suggests, To Move (Ours. Mine.) is comprised of two lists of household items to move. Printed using a photoetching process, both were made from the same narrow copper plate. One print details the belongings of a couple: bed, files, sewing machine, camping & sports equipment, etc. The other evidences many erasures. Describing the belongings of only one: file, sewing machine, camping equipment, etc., it reveals an alteration of the original list. Gray smudges are the meager remnants of the many missing items, lone evidence of where the copper printing plate was ground down for removal. Ultimately, To Move (Ours. Mine.) presents a narrative of a union disintegrated. The lists together address the topics of unity, loss, heartbreak, memory, and even consumerism. This story of moving - moving in and moving out - is told only through the material items the characters own, through which objects they share, which they keep, and which they lose. This simple approach to depicting such complex topics is what interests me most: that two stark lists might possibly relate the strain and emotion of love lost. Kelly Sherman, May 2007. Both lists were printed in an edition of 60 on Hahnehahle Copperplate paper and are included in a single frame designed by the artist. Please contact Director James Stroud for details. Fresh out of art school, this young graffiti writer was invited by master printer James Stroud into the studio to create a new tag for a fine art print. The result is 0³, a 3 x 4 foot copper plate drypoint drawn with an electric engraving tool. 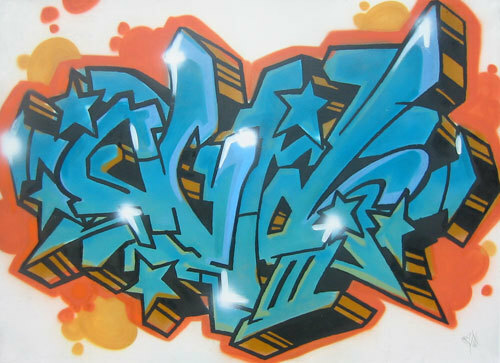 Each sheet of paper is first painted with color "fills" using Montana spray paints. The copper plate containing the outline is then printed in black over the color to complete each image. This is an open edition print yielding a series of unique versions of the tag. There are currently 16 versions available. New York painter Carrie Moyer was invited to produce a series of monotypes at Center Street late summer 2006. Two series of images emerged using a combination of monotype, graphite drawing and woodcut. Those who know Moyer's work will notice a migration toward straight up abstraction in these works on paper, a deliberate move away from the recognizable "pictures" and landscape references of her earlier painting. A total of sixteen unique prints are available. In a blank square or rectangle, the corners are the only details, with the four sides being responsible for their creation, as well as their unification. In the "Limbo" series, I provide the corners with an alternative route to connect with each other - one that is organic and loose, in sharp contrast to the rigid perimeter. "Limbo" represents the initial liberation of the picture plane and the resulting state of flux.